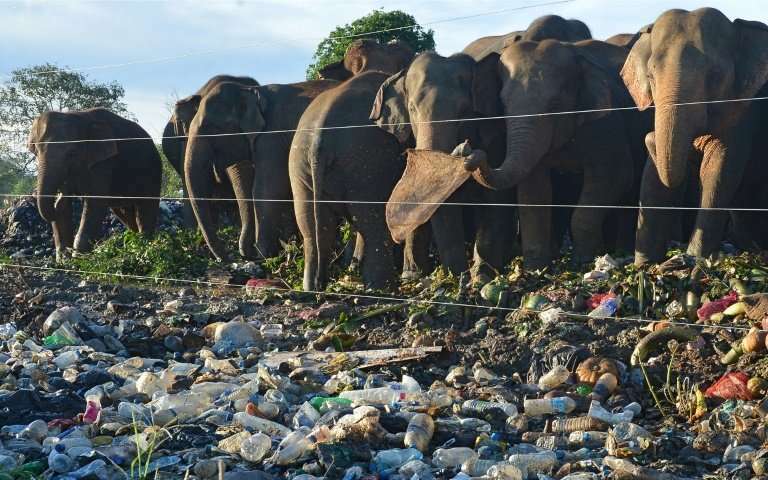 At a garbage dump in central Sri Lanka a herd of wild elephants forage among a mountain of rubbish, swallowing dangerous scraps of plastic mixed with rotting food in what experts warn is an increasing problem for the revered animals. 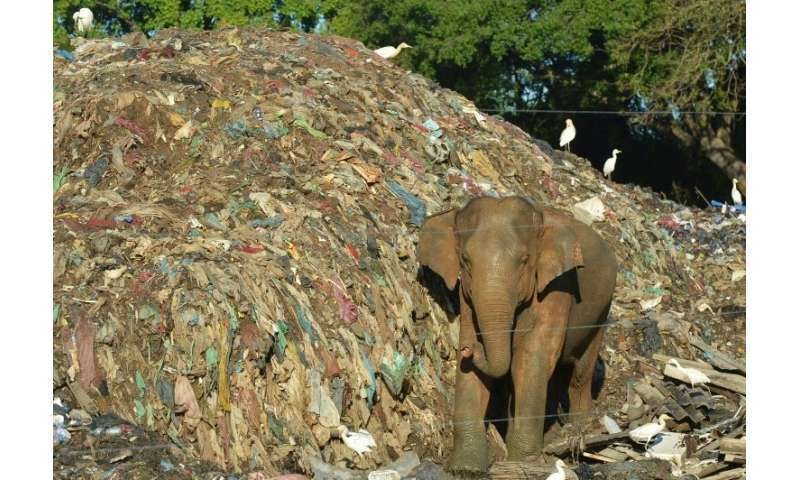 Due to illegal dumping near wildlife sanctuaries, hundreds of Sri Lanka's estimated 7,500 wild elephants now scavenge at rubbish tips and many are being made sick by what they eat, Jayantha Jayewardene, an expert on Asian elephants, said. "Sri Lanka considers elephants to be a national treasure, but we see these animals reduced to eating rubbish," Jayewardene told AFP Thursday. "They have become docile and got so used to tractors bringing them garbage." 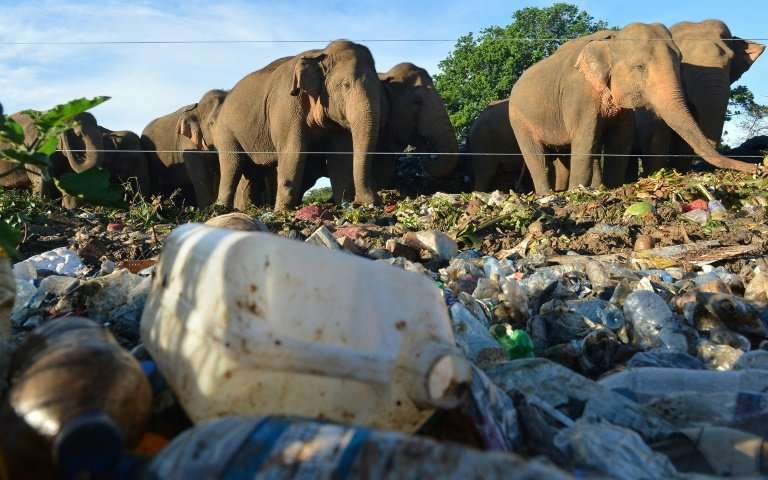 A herd of 20 wild elephants at Habarana in the east of Sri Lanka has become totally dependent on rubbish and behaved almost like domestic animals waiting for tractors to tip the garbage. "These elephants no longer forage in the jungle. They are like zoo animals. It is a sad sight to see national treasures picking through rotting rubbish," he said. The animals can be seen covered in smelly garbage and rooting among piles of plastic bottles, a far cry from the majestic jumbos portrayed in travel brochures. Jayewardene said the solid waste included plastic scraps despite a government ban on non-biodegradable polythene. Hundreds of elephants elsewhere are also known to forage at dozens of rubbish tips near elephant habitats. "Elephants are getting sick by eating plastics," he said. "We don't, however, have post mortem evidence yet of polythene causing deaths, but this is a real concern." The government last year banned the open dumping of garbage near wildlife sanctuaries to discourage elephants from risking their lives by foraging for rotting food. 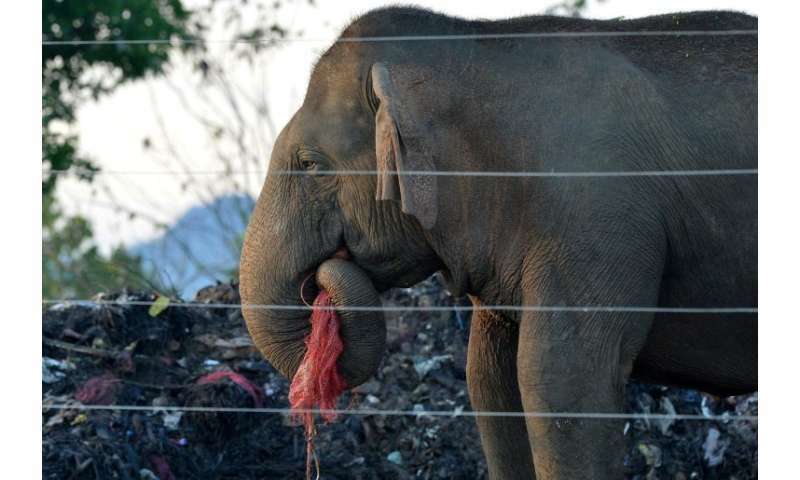 At one dump in Digampathana, 160 kilometres (100 miles) northeast of Colombo, an elephant was recently seen trying to open a plastic sack to get at an onion and ended up swallowing the plastic as well. The government has ordered electric fences be erected around more than 50 dumps near elephant habitats to keep the roaming beasts away. Some have not been put up while others are ineffective, according to local residents. "Around 300 wild elephants are hanging around them (dumps)," the government said in a statement issued last year. "When elephants consume bacteria-infested waste... it shortens their lifespan." The problem is worse for a herd of spotted deer at Koneswaran in the northeastern district of Trincomalee where frequent deaths have been reported due to plastic poisoning. Local wildlife officials told AFP that there was no effective enforcement of the garbage ban. Sri Lanka cracked down on haphazard disposal of garbage after 33 people were buried alive when a huge 90-metre (300-foot) rubbish tip at the edge of the capital Colombo collapsed destroying more than 100 homes. Since then, plastics have been banned and prosecutions been threatened for illegal dumping. But enforcement remains a problem. Elephants are venerated in Buddhism, the majority religion in Sri Lanka, and are protected by law.